Ferdinand Magellan was born in Sabrosa, near Vila Real, in Northern Portugal. At 12, Magellan became a page to King John II and Queen Eleonora. 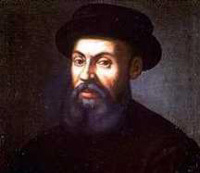 Here Magellan continued his education, becoming interested in geography and astronomy. 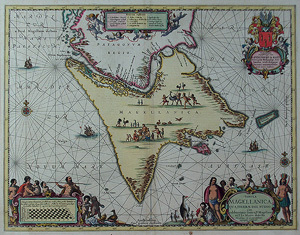 At age 20, Magellan first went to sea; In 1505 he was sent to India and in 1599 Magellan journeyed to the East Indies, taking part in expeditions to the Spice Islands. In 1510, Magellan was promoted to the rank of captain. However, after secretly sailing a ship east without permission, he lost his command and was forced to return to Portugal. In 1511, Magellan was sent to Morocco where he fought in the Battle of Azamor and received a severe knee wound. 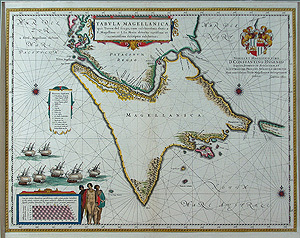 Magellan was accused of illegal trade with the Islamic Moors and have also been given a poor report by the Viceroy of India. 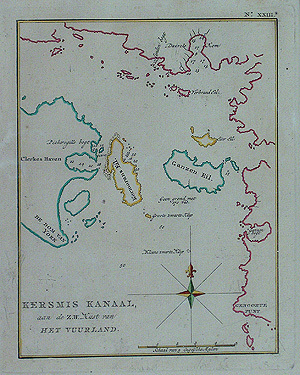 Magellan fell into disfavour with King Emanuel I, who refused to raise Magellan's pension and told Magellan that he would have no further employment in his country's service. Magellan renounced his nationality and offered his services to the court of Spain. Magellan reached Seville in 1517, and from there went to Valladolid to see Charles I. He became a Spanish National and began to acquire great influence in Seville. He gained the ear of Charles and Juan Rodriguez de Fonseca, bishop of Burgos and enemy of Christopher Columbus. 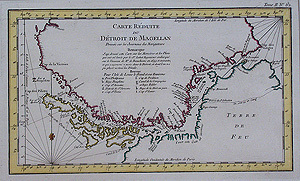 By this time, Magellan had found a map that indicated the Rio de la Plata, a large bay-like river delta in South America, as a passage through that continent to the Pacific Ocean. 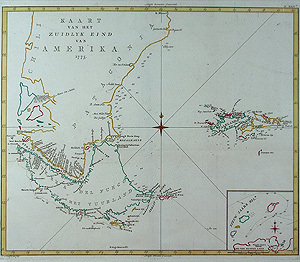 He decided to pioneer this route to reach the Spice Islands, the key to the strategic and lucrative spice trade. 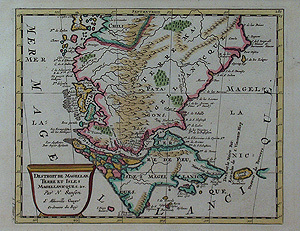 On March 22, 1518, King Charles approved Magellan's plan and granted him generous funds. With the money that Magellan and Faleiro had received from the king, the pair obtained five ships: the Trinidad, the San Antonio, the Concepcion, the Victoria and the Santiago. The Trinidad was Magellan's flagship. On August 10, 1519, the fleet of five ships under Magellan's command left Seville. 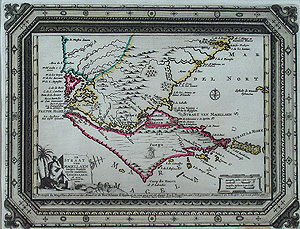 The Portugese King ordered a naval detachment to pursue him, but Magellan eluded them. On November 20, the equator was crossed; on December 6, the crew sighted Brazil. Since Brazil was Portuguese territory at the time, Magellan avoided it, and on December 13 anchored near present-day Rio de Janeiro. There the fleet was resupplied, and they continued to sail south along South America's east coast, looking for the strait. 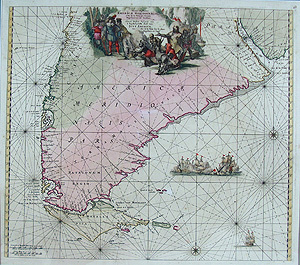 The fleet reached Río de la Plata on January 10, 1520. Magellan decided to spend the winter in Patagonia. 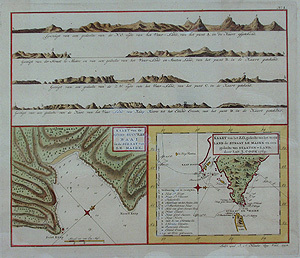 On March 31, the crew established a settlement that they called Puerto San Julian. On August 24, the journey resumed. Magellan, behind schedule, was impatient to make up for lost time, and set out again while the weather still posed problems. The Santiago, sent down the coast on a scouting expedition, was wrecked in a sudden storm. After this, Magellan decided to wait for a few weeks more before again resuming the voyage. On October 21, 1520, the fleet reached Cape Virgenes and concluded they had found the passage, because the waters were brine and deep inland. Magellan called the passage Estreito (Canal) de Todos los Santos, or "All Saints' Channel," because All Saint's Day, November 1, occurred while the fleet traveled through it. 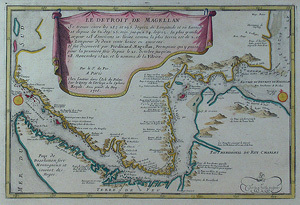 Now, the strait is named the Strait of Magellan. 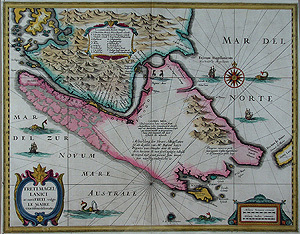 Magellan first assigned Concepcion and San Antonio to explore the strait, but the latter deserted and returned to Spain. On November 28, the three remaining ships entered the South Pacific. 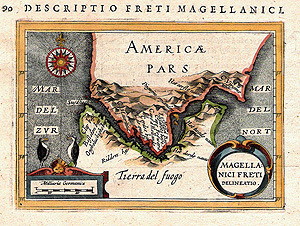 Magellan named the waters the Mar Pacifico (Pacific Ocean) because of its apparent stillness. 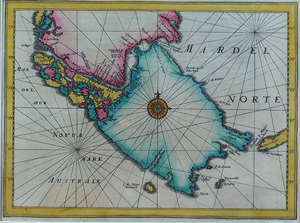 Heading northwest, the crew reached the equator on February 13, 1521 and at the beginning of March arrived at the Philippines, with 150 crewmen left. It was here that Magellan was to meet his death. He was killed on April 27 in the Battle of Mactan against indigenous forces led by Lapu-Lapu. "When morning came, forty-nine of us leaped into the water up to our thighs, and walked through water for more than two cross-bow flights before we could reach the shore. The boats could not approach nearer because of certain rocks in the water. The other eleven men remained behind to guard the boats. When we reached land, [the natives] had formed in three divisions to the number of more than one thousand five hundred persons. When they saw us, they charged down upon us with exceeding loud cries... The musketeers and crossbow-men shot from a distance for about a half-hour, but uselessly... Recognizing the captain, so many turned upon him that they knocked his helmet off his head twice... An Indian hurled a bamboo spear into the captain's face, but the latter immediately killed him with his lance, which he left in the Indian's body. Then, trying to lay hand on sword, he could draw it out but halfway, because he had been wounded in the arm with a bamboo spear. When the natives saw that, they all hurled themselves upon him. One of them wounded him on the left leg with a large cutlass, which resembles a scimitar, only being larger. That caused the captain to fall face downward, when immediately they rushed upon him with iron and bamboo spears and with their cutlasses, until they killed our mirror, our light, our comfort, and our true guide. When they wounded him, he turned back many times to see whether we were all in the boats. Thereupon, beholding him dead, we, wounded, retreated, as best we could, to the boats, which were already pulling off." After the death of Magellan and many crew, the expedition was left with too few men to sail the remaining ships. On May 2, 1521, they abandoned Concepcion, burning the ship and fled westward to Palawan, from there they sailed onto Brunei, and then onwards to the Moluccas. 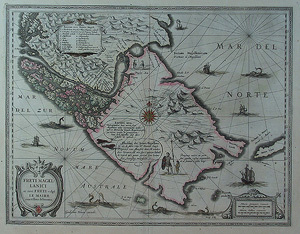 As they left the Moluccas the Trinidad was found to be taking on water and need to be overhauled. The small Victoria was not large enough to accommodate all the surviving crewmembers. The Victoria set sail via the Indian Ocean route home on December 21, 1521 and arrived back to Spain on September 6, 1522, almost exactly three years after leaving. A 'camel without humps' (possibly the llama, guanaco, vicuña, or alpaca). A black 'goose' which had to be skinned instead of plucked, which is the penguin. Two of our closest galaxies, the Magellanic Clouds, visible from the Southern Hemisphere. The extent of the Earth, their voyage was '14,460 leagues' (or 69,000 km). The need for an International date line; upon their return they observed a mismatch of one day between their calendars and those who did not travel, even though they faithfully maintained their ship's log.